Deutsche Bank downgraded ComfortDelGro to Sell from Buy amid signs that competition from ride-hailing companies may be getting ugly. “With the impending entry of Grab’s chief competitor, Go-Jek, Grab has increased incentives to widen the driver income gap with ComfortDelGro’s (CD) drivers by 24 percent, signalling the start of a potential price war,” Deutsche Bank said in a note on Wednesday. “More importantly, this highlights the scenario that is likely to unfold each time a well-capitalized e-hailing competitor enters the market and the long-term threat to CD’s taxi fleet,” the note said. 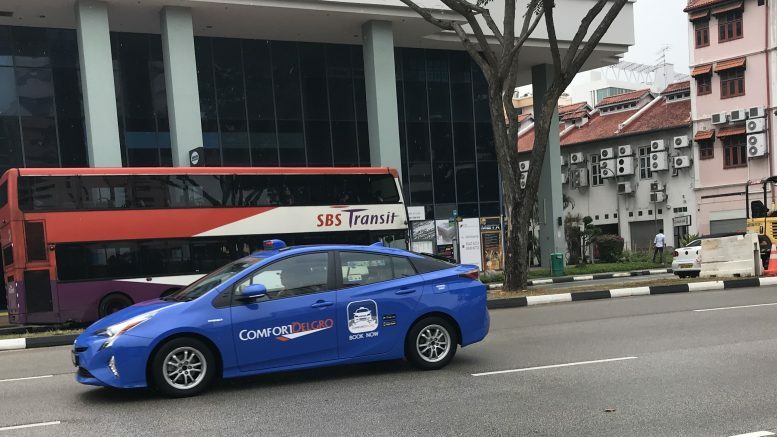 It said it expected the higher incentives would drive attrition in ComfortDelGro’s taxi fleet and put consensus earnings estimates at risk. Deutsche Bank said its calculations indicate Grab’s current incentives allow its drivers to earn as much as ComfortDelGro’s drivers, with its “monthly income guarantee” program a “marked change” as it guarantees up to two times current estimated gross revenue of S$6,328 a month. Based on its model of a similar situation from the Grab-Uber incentive war, it estimated ComfortDelGro’s taxi fleet could fall as much as 27 percent in 2020. While Grab’s program was due to end in December, it could be extended depending on the competition from Go-Jek, which will be launching in Singapore in November, Deutsche Bank said. It also pointed to another risk: the cost of the Certificate of Entitlement (COE), or permission to own a car in the city-state, has dropped 70 percent since 2013, spurring a rise in car ownership and a decline in taxi use. That also carried the risk that new car owners could use their vehicles to become private hire car (PHC) drivers, bolstering that fleet’s size, it said. “Our calculations using current COE costs show that PHC drivers need to drive only three hours daily to cover their car ownership cost,” it said. It cut its 2019-20 earnings forecasts by 6 percent and 21 percent, respectively, and slashed its target price to S$1.70 from S$2.70. The investment bank forecast 2018-20 net profit of S$297 million to S$269 million, which it said was around 3 percent to 20 percent below consensus. The stock tumbled 7.20 percent to S$2.19 by 3:21 P.M. SGT.